International non-government organization Dan Church Aid (DCA) of Denmark has honored Surya Bahadur Thapa, executive chairperson of Friends Service Council Nepal (FSCN), with the award of International Humanitarian Hero 2017. This award is given every year by the DCA to acknowledge those individuals who have greatly contributed in the humanitarian sector. Thapa was chosen from among candidates from 40 countries where DCA is currently active in the humanitarian sector, read a statement issued by FSCN, Lalitpur on Tuesday. The award ceremony was held on April 29 at the DCA headquarters in Copenhagen of Denmark. 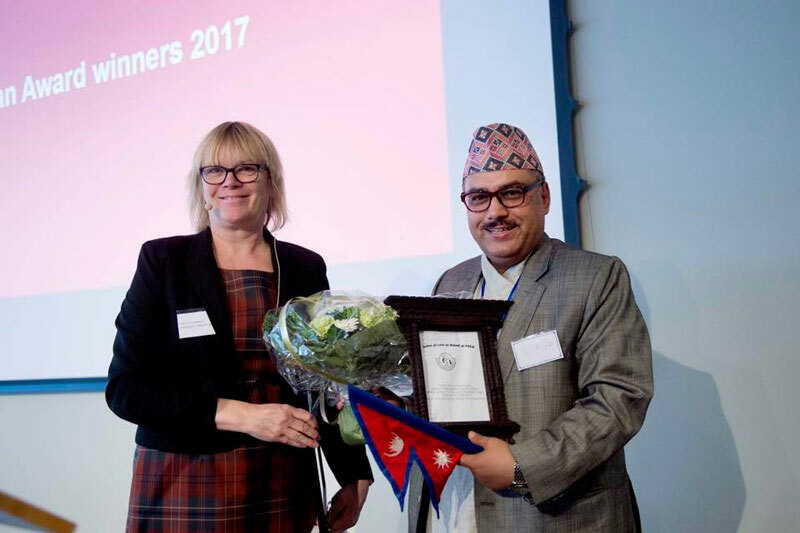 The award was handed over to Thapa by the General Secretary of DCA headquarters Birgitte Qvist-Sorensen in a special ceremony. After the devastating earthquake of 25 April 2015, FSCN in leadership of Thapa immediately started the relief distribution to the earthquake affected communities of Bhaktapur and Lalitpur districts in partnership with DCA, World Jewish Relief (WJR) and in coordination with District Disaster Relief Committees (DDRC) and the local level state agencies, read the statement. The FSCN stated that Thapa has been actively working in social service, humanitarian sector and for the human rights of the marginalized people since past 30 years. He is also the Founder / Chairperson of National Disaster Management Network of Nepal (DIMANN) and Treasurer of Forum for Protection of Consumers Rights-Nepal .In the past the he had also worked as Treasurer in Social Welfare Council.